ISP-supplied modem router can't keep up with multiple Wi-Fi demands - PC Buyer Beware! Internet Service Providers (ISPs), such as the British companies BT, Sky, Virgin Media, Plusnet, Post Office, etc., provide broadband customers with a modem router that can be used as a networking device for cabled and Wi-Fi connections and connect to the web via its modem. However, these modem routers are usually inexpensive devices that are not up to the Wi-Fi demands that many users require of them. Fortunately that problem is easy to solve by buying a dedicated router that does not have a modem, is connected to a broadband modem router and can handle the Wi-Fi demands of many devices – desktop and laptop PCs, tablets, smartphones, printers, Blu-ray disc players, wireless Network Attached Storage (NAS) devices, etc. – and video-streaming services, such as Netflix and Amazon Prime in the UK. Both modem routers and dedicated routers can be purchased, both can be connected to cabled and wireless devices, but only a modem router can go online using its cable or ADSL modem. The UK telephone landlines require the use of an ADSL modem for a broadband connection. Cable and superfast fibre broadband connections are also available that require their own types of modem router in order to connect multiple devices to the web and a wired/wireless network. Currently (January, 2016), the best dedicated multiple-user router is the Linksys WRT1900ACS multiple-user model – currently priced at £180.00 – that supports all of the Wi-Fi standards – 802.11b/g/n/ac – which means that no wireless device needs to be discarded or all devices can be upgraded to the fastest 802.11ac standard. This router also provides many features that ISP-supplied router modems do not, such as the ability to connect to multiple devices simultaneously (older routers can only serve one device at a time) and be set to priorities them. It comes with an Ethernet cable that connects it to a modem router. An image of it is shown below. There are apps that make customisation of devices that use Apple’s iOS and Google’s Android mobile operating systems easy. Among this router’s other useful features is an eSATA port that can be used to connect an external SATA hard disk drive that can be used as a Network Attached Storage (NAS) device that can be used as a file server or video-streaming device instead of using a Wi-Fi NAS. Visit the following page on the Linksys site to find out the features that it provides. 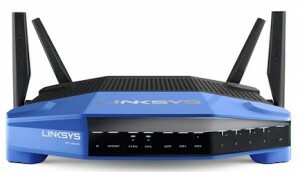 An alternative, cheaper (£150.00) dedicated router is the Linksys EA8500 Max-Stream AC2600 MU-MIMO Smart Wi-Fi Router. January 2, 2016 in Networking and Internet Problems.